Understanding how usernames, group names, user ids (uid) and group ids (gid) map between the processes running inside a container and the host system is important to building a secure system. Without any other option provided, processes in containers will execute as root (unless a different uid was supplied in the Dockerfile). This article will explain how this works, how to properly grant privileges and show examples to illustrate. To start, let’s review how uids and gids are implemented. The linux kernel is responsible for managing the uid and gid space, and it’s kernel-level syscalls that are used to determine if requested privileges should be granted. For example, when a process attempts to write to a file, the uid and gid that created the process are examined by the kernel to determine if it has enough privileges to modify the file. The username isn’t used here, the uid is used. When running Docker containers on a server, there’s still a single kernel. A huge part of the value that containerization brings is that all of these separate processes can continue to share a single kernel. This means that even on a server that is running Docker containers, the entire world of uids and gids is controlled by a single kernel. I’m going to start by logging in to a server as a normal user (marc) that is in the docker group. This allows me to start docker containers without using the sudo command. Then, from outside the container, let’s look at how this process appears. Interesting. Even though I never typed sudo and I wasn’t root, the sleep command I executed is started as the root user and has root privileges. How do I know it has root privileges? Does root inside the container == root outside the container? Yes, because, as I mentioned, there’s a single kernel and a single, shared pool of uids and gids. Because the username is showing up outside the container as “root”, I can know for certain that the process inside the container was started with a user that has uid = 0. What happens when I create a different user inside my Dockerfile and start the command as that user? To simplify this example, I’m not specifying a gid here, but the same concept applies to group ids. First, I’m running these commands as user “marc” which has uid of 1001.
marc@server:~$ docker build -t test . What exactly is happening here and what does this show? I built a Docker image that has a user named “appuser” and this user has a defined uid of 1001. On my test server, the account I’m using is named “marc”, and it also has the uid of 1001. When I start the container, the sleep command executes as appuser, because the Dockerfile contains the line “USER appuser”. But this really doesn’t make it run as appuser, it makes it run as the uid of the user that the Docker images knows as appuser. When I examine the processes running outside of the container, I see that it’s mapped to the user “marc”, but inside the container it’s mapped to the user “appuser”. Both of these usernames are just showing the username that their execution context knows maps to 1001. This isn’t super important. But what is important is the know that inside the container, the user “appuser” is getting the rights and privileges of the user “marc” from outside the container. Granting a privilege to user marc or uid 1001 on the linux host will also be granting those privileges to appuser inside the container. 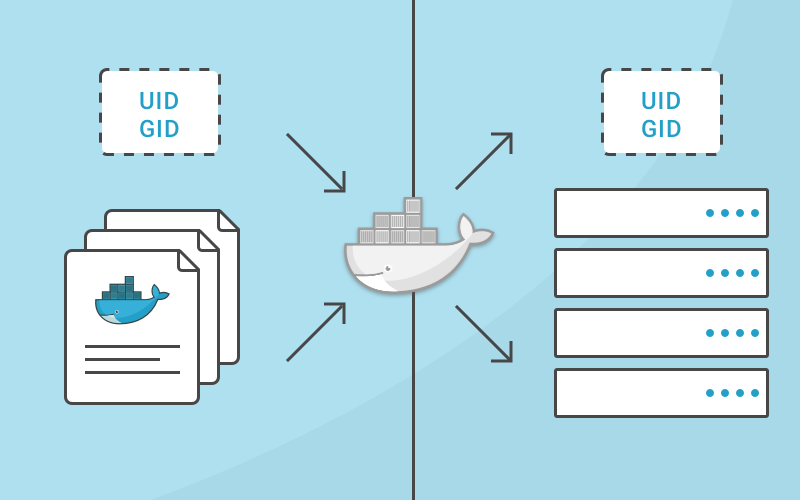 Another option is to run a docker container and specify the username or uid, and also the group name or gid at runtime. Using the initial example from above again. What did I do here? I created the container to start as the 1001 user. So the process maps to the “marc” user when I execute commands such as ps or top (or most monitoring tools). Interestingly, when I exec into that container, you can see that the 1001 user doesn’t have an entry in the /etc/passwd file, and shows up as “I have no name!” in the bash prompt of the container. It’s important to note that specifying a user flag when creating a container also overrides that value from the Dockerfile. Remember the second example where I used a Dockerfile that had a uid that mapped to a different username on the local host? What happens when we run that with a user flag on the command line to start a container that executes the “sleep infinity” process? In the final example above, you can see that I ended up with 2 containers running the sleep process, one as “marc” and one as “root”. This is because the second command changed the uid by passing the --user flag on the command line. If there’s a known uid that the process inside the container is executing as, it could be as simple as restricting access to the host system so that the uid from the container has limited access. The better solution is to start containers with a known uid using the--user(you can use a username also, but remember that it’s just a friendlier way of providing a uid from the host’s username system), and then limiting access to the uid on the host that you’ve decided the container will run as. Because of how uids and usernames (and gids and group names) map from a container to the host, specifying the user that a containerized process runs as can make the process appear to be owned by different users inside vs outside the container. I ran these tests on an Ubuntu 16.04 server. While it’s possible to execute the same commands and tests on Docker for OSX, you’ll see different results because Docker for OSX is actually executing docker-engine on a Alpine Linux based virtual machine, and the commands you execute are executing on OSX. If you’re using Docker to ship your SaaS application, you should check out www.replicated.com to power an enterprise, installable version of your product.